UW senior Osman Salahuddin is checking his watch. 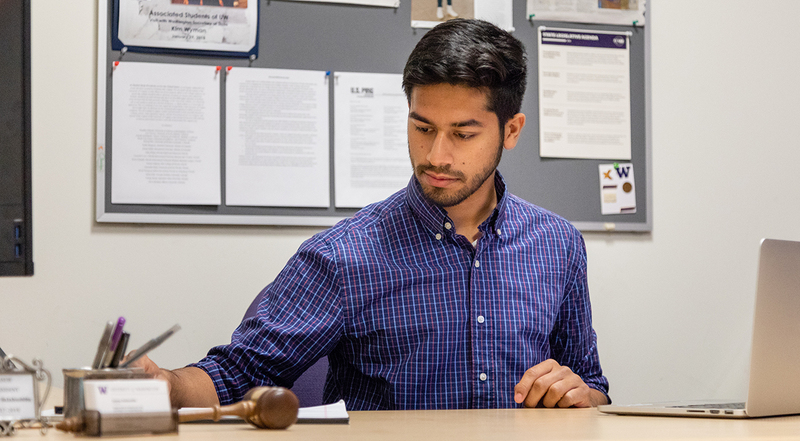 As president of the Associated Students of the University of Washington (ASUW), Salahuddin always has another meeting to get to, another project to tackle. But his packed schedule is nothing new. Over the past four years — the first three as a commuter student from Redmond — Salahuddin has completed a major in neurobiology, a minor in English, four research projects, a study abroad in Rome, and demanding leadership roles with ASUW. That calendar started filling up as soon as Salahuddin arrived on campus. As a freshman, he found a sense of community through involvement with the Muslim Student Association, whose board he joined the following year. Salahuddin also participated in UW Leaders, an ASUW program that pairs freshman and sophomores with more seasoned students who serve as mentors. Weekly programming covers topics like team building, resume development, and professional leadership. To further his leadership experience, Salahuddin joined the ASUW’s student senate during his sophomore year, where he gained “a really good perspective on the ways decisions are made in the University.” He parlayed that into the role of ASUW’s director of community relations the following year, serving as a liaison to student communities across campus, including residential students, commuter students, students in the Greek community, student athletes, and diversity groups in the Ethnic Cultural Center. He also joined the Arts & Sciences Advisory Council for Students, a group that advises College of Arts & Sciences leadership on academic issues that impact students. Looking back, everything that I’ve done at the University of Washington has prepared me for something else. Despite Salahuddin’s demanding leadership roles, he has always carved out time to focus on academics, especially his neurobiology major. “The tie between the scientific details and the actual behavior of humans and animals is what draws me to neurobiology,” he says. “I like that they teach what our brain responses make us feel at the non-scientific level.” Salahuddin added an English minor — and participated in a Department of English study abroad program in Rome — to round out his education. That humanist approach has informed Salahuddin’s choice of research projects as well. His first research position, at Fred Hutchinson Cancer Research Center, focused on aging through the study of yeast. But Salahuddin wanted to go beyond a lab setting and interact with more people. He joined a Department of Biology research project linking students’ study habits and their test scores, and a project at the UW Medical Center (UWMC) working with patients with traumatic brain injuries. He also conducted research aimed at improving patient care in the UWMC Emergency Department. In July, Salahuddin will begin a job as a health care consultant in New York City, helping companies in diverse sectors explore their health care options. Looking ahead, he hopes to pursue an MBA with an emphasis on health care. During his time at the University, Osman Salahuddin received support from a Washington State Opportunity Scholarship, an Office of Minority Affairs & Diversity scholarship, a GO Scholarship for study abroad, and more. Learn more about how you can support College of Arts & Sciences students like Salahuddin.